But as a mobile-mainly platform, one of Periscope’s limitations had been that archived broadcasts could only be viewed on the iOS or Android apps, not on the Web. 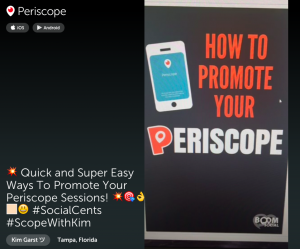 So, for example, here’s a broadcast from Kim Garst (shared with me by colleague Tony Hart) on how to promote your Periscope broadcast. You can watch it until about 9 a.m. CDT on Thursday, June 25. It will be interesting to see what this does to replay views for Periscope broadcasts, and for the popularity of the platform as compared with Meerkat. Thanks Lee! Got this from your #Periscope yesterday, of all places. 1. Must launch from Twitter announcement on Twitter on desktop/laptop. 2. Did not work for me in Safari; switched to Chrome, which worked fine.